To record any observations or interviews carried out in the process of ethnography. 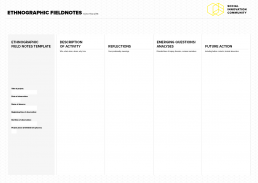 Fieldnotes are the data source in ethnography. This is a guide for an individual researcher or a group of researchers to use during and after any observation or interview. It is good practice to separate the emic (what people said/ did) from the etic (What you inferred from that) for the purposes of analysis. Ethnography is an iterative approach. You will want to come back to fieldnotes as you learn more about your chosen community and see how your own understandings have changed.